President Nixon signed the “War on Cancer” into law in 1971. Nearly half a century and hundreds of billions of dollars later, it looks like we are still fighting a losing battle. Or are we? What if a natural solution had been discovered, but had just been overlooked by the pharmaceutical industry due to lack of profit potential? When a new, natural and non-toxic way to address cancer is being discovered, it is a game-changer that does not go unnoticed in the scientific community. But instead of being hailed and embraced, it is fiercely opposed by prominent scientists with strong ties to the pharmaceutical industry and the might of the government is called upon to the rescue, to perpetuate a failing model that contributes to losing the war on cancer. A new breakthrough book, an amazon best-seller, Winning the War on Cancer: The Epic Journey Towards a Natural Cure (Morgan James, June 2018) reveals the visionary discoveries of a French scientist whose suppressed research led to improvements in the prevention and treatment of cancer…naturally and without toxicity. This book is a “story within a story” as through its pages, Sylvie Beljanski, the daughter of Mirko Beljanski, PhD, outlines a personal journey of discovery of her father’s new, and promising, paradigm for the treatment of cancer. This tale unfolds against the backdrop of the French establishment, determined to obliterate the findings of the world’s first green molecular biologist, one who spent over 40 years studying the environmental impact of DNA replication and transcription. 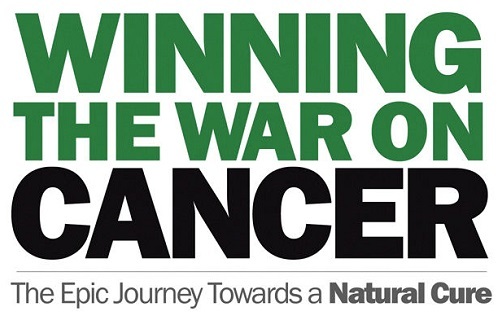 Q: Sylvie, are we winning the war on cancer? A: The data looks bleak: according to a report by the American Cancer Society, the number of cancer cases around the world is expected to double by 2030. However, I feel that we are meeting a turning point, and to some extent, yes, we are winning the war on cancer, but it is not the doing of pharmaceutical companies; rather it has to do with people understanding that we are living in an extensively polluted planet and starting to take action about it. They are eager to educate themselves to make better, healthier choices with their food and learn about their health options. I do believe that integrative medicine may allow us to win the war on cancer if done intelligently, by seeking natural compounds that are effective and non-toxic. Q: How can the government help the process of discovering and shaping new treatments for preventing or treating cancer? A: What if the best treatment is natural, and is of no interest to pharmaceutical companies? Today, it would go unnoticed. The system is distorted. By changing patent laws that force medical companies to create a new man-made molecule in order to be able to patent and make money on it, by changing the way scientific grants are awarded, by creating a patient-centered and health-centered health system rather than a sick-centered health system, the government could possibly create a new way to look at cancer drugs. But this is not an easy task. On the other hand, preventing dietary supplement manufacturers from making any health claims, even when backed by solid science, deprives the public access to useful information, and is something that the government could easily change. Q: Will our healthcare system be able to afford the way it’s going when it comes to funding expensive cancer treatments? A: As it is, the healthcare system is definitely going bankrupt, but to me the main issue is not so much whether the treatment is expensive or affordable, but rather whether it is effective. Even an inexpensive treatment, which is not effective, still costs too much. I believe that in the long run the smartest approach would be prevention, which by itself means education. It always amazes me to see that governments on one hand complain that there is not enough money to fund the healthcare system but at the same time there is nothing being done to look into natural, affordable solutions. Hopefully people are getting there by themselves without waiting for governmental action. Q: What inspired you to tell the story of what happened to your father? A: For a long time it was too painful, I just could not talk about it. And then, little by little, after years of serving on the executive board of The Beljanski Foundation, my father’s story became a part of my own story. Once I owned it, I was able to share it. Now I am doing so because I strongly believe that this story can make a difference in other people’s lives. I often hear people say if there was something “out there” that they should have heard about it. But it is not that simple, sometimes the truth is suppressed and the message is too painful to share. That doesn’t make the message any less important. Q: It’s also a story of how you, a lawyer, became a health expert involved in attacking the number one problem. Do you think people will find inspiration from reading your book? A: I would like to think that by reading Winning the War on Cancer people will find inspiration, hope, and a few suggestions to help improve their health. Nothing had prepared me for this mission but when I realized that I was basically the only one able to carry it out in New York, since everything had been destroyed in France, I decided to stand up. Growing up I had the opportunity to see firsthand how effective my father’s approach was and I just could not allow for its destruction, although I had no idea how difficult it would be. To me it has been a tremendous opportunity for growth, discovering what my life’s purpose is, and being given the chance to fulfill it. Q: What did your father’s research uncover when it comes to treating cancer naturally? A: The cornerstone of my father’s research is that most cancers result mainly from a progressive and cumulative destabilization of the DNA, rather than a mutation. To a certain extent, this slow process gives us opportunities to prevent what is happening, and to fight it. Also, my father had the idea that if nature came up with carcinogens, nature had also come up with natural anti-carcinogens. He discovered two of them, one coming from the bark of a tree from the Amazon rainforest, and the other one from a bush in West Africa. Research confirmed that they were not toxic, effective on a large array of cancers, and able to work in synergy with chemotherapy. Q: What does the Beljanski Foundation do today, 20 years after its founding? A: The Beljanski Foundation’s mission is to sponsor research programs with various natural extracts recognized by Mirko Beljanski for their anti-cancer properties. Research has entailed programs on prostate cancer at Columbia University, including advanced prostate cancer that no longer responds to chemotherapy, as well as ovarian and pancreatic cancer at Kansas University Medical Center. All of these studies were completed using the same botanical extracts. They have been reported effective on males and females and have also exhibited great synergy with a variety of chemotherapies. We are now looking at cancer stem cells, those cells deemed to be responsible for cancer relapse and metastasis, and the preliminary data is extremely promising. Our work is made possible by the generous donations of individuals who believe in the mission of The Beljanski Foundation. Q: Your father was a scientist in Paris at the prestigious Pasteur Institute, but at some point, was forced to leave. Why? A: During the 60s and 70s, the genome, then recently discovered by Watson and Crick, was looked upon as the future of medicine, and the director of the Pasteur Institute wanted everyone to work towards engineering genetic drugs. Instead, Mirko Beljanski was drawn to environmental medicine and to what caused cancer in the first place. Environmental medicine was a new field of medicine at the time and considered highly controversial because no one wants to be held responsible for pollution and subsequent diseases. Today, Mirko Beljanski is considered the “Father of Environmental Medicine” because he was the first one to provide a scientific explanation at the level of the DNA on how environmental toxins can affect our DNA and induce cancer. Q: Do you believe the French government poisoned your father to silence his work? Why? A: Yes, I do. Even though there was no “smoking gun” there was a lot of circumstantial evidence, including, of course, the fact that they did not even care to give him a day in court and respect the due process, as if they knew he was about to die. He was a healthy man until he developed acute myeloid leukemia just two months after the unwarranted spraying of his laboratory by a SWAT team that did not even belong to the police force. I believe they did so because they had no serious case against him but still wanted to get rid of him and his research. My father’s lab was the only independent laboratory working on cancer at the time in France. Q: How did he help an ailing French president, Francois Mitterrand? A: Long before the Mitterrand story, many doctors in France routinely prescribed my father’s products with great success, including the family doctor of Mitterrand’s mistress. When Mitterrand was diagnosed with advanced prostate cancer, the surgeon who performed surgery saw that the cancer had spread everywhere. He predicted that Mitterrand would not complete his term and that the country should prepare for early elections. Upon his mistress’s insistence, Mitterrand agreed to consult with her doctor and take Beljanski’s products. Against all odds, Mitterrand started to get better and better, and was finally able to finish his term. Unsurprisingly, a number of powerful people were so infuriated by the lost opportunity to seize power that when Mitterrand finally passed away, they sent a SWAT team to destroy Beljanski’s laboratory. Q: What lasting message do you hope readers of your book will be left with? A: If you think that finding your life’s purpose is hard, wait until you get to the part of fulfilling it! Fulfilling your life’s purpose will require you to muster all of the courage you can, consume all of your energy, and force you to face people who will try to derail you by throwing their negativity at you. It will be more than a bumpy road: brace yourself for the roller coaster! I never would had found the strength to fulfill my goals if I had not felt that my life’s purpose was actually bigger than my own life. In the end, if I can make a difference by sharing with the world this information about fighting cancer naturally, I believe that it was all worth it. This entry was posted in General, Interviews and tagged Amazon Best-Seller, author interview, book publicity, media connect, Sylvie Beljanski, War on Cancer. Bookmark the permalink.